Planned Giving makes up over 80% of our parish annual income, and is crucial for the Parish’s thriving. 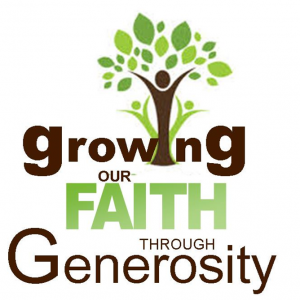 Every three years we begin a new parish Stewardship Renewal or Parish Planned Giving campaign. This is the time when we reflect more consciously on the contribution we make to our parish family, by giving of our time, our talents, and our finances. We know that we are blessed to live in this nation and we have a beautiful church and facilities, and a great staff. We need to ensure that all our facilities are maintained and our parish efficiently run by our office staff, our leadership team, and our volunteers. We know that God loves generous hearts, and that people want to support parishes that are doing good things to spread the Good News everywhere. The Parish is always in need of financial support. We have a large staff, excellent facilities, and good programmes which all require money. Our mission as a Parish is to lead people to God. As well as Sunday Mass and the sacraments, we have many other spiritual and social programmes, all of which require financial support. While many use paper envelopes to support the parish on a weekly basis through the parish Thanksgiving Offertory or Planned Giving Programme, some have opted to switch to regular automated Credit Card or Direct Debit contributions. This helps the parish in planning and ensures regular contributions so we do not fall short during holiday periods, and when parishioners are travelling. Please take time to look at our parish Stewardship brochure, and prayerfully consider what you wish to give. Enrol in the Parish Planned Giving Offertory Programme now by contacting the Parish and request to have the brochure and forms posted to you, or download and complete a Commitment Card. Set up regular automated Credit Card contributions: CLICK here to download, complete and submit the Credit Card Contributions Authority form. Set up regular automated Direct Debit contributions: CLICK here to download, complete and submit the Direct Debit Contributions Authority form. Who could / should make a pledge? Are you new to our Parish community? Have you just started attending mass again recently or more regularly? Do you visit our parish regularly? Do you just contribute your loose coins on the plate when you are at Mass? Would you like to consider a more regular contribution? Have you finished school or university and recently begun working, and now feel able to contribute even if only in a small way? Do you have children at our Parish School, St Francis of Assisi Primary School, and wish to help support the Parish better? Are you a current envelope contributor? We especially appreciate your continued support and ask if you can consider increasing your pledge? The Parish needs your support to carry on the mission of Jesus.